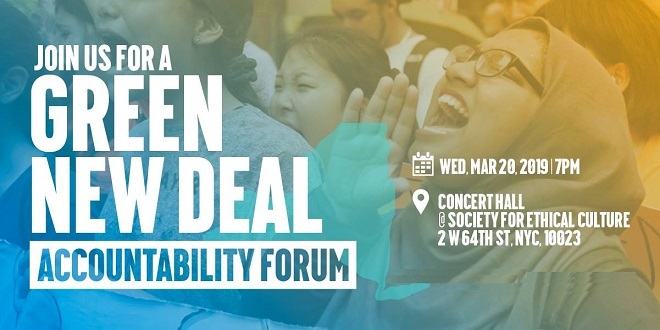 Join us at town hall style forum to question Governor Cuomo, leaders of the state legislature, Attorney General James and Comptroller DiNapoli, and City-wide elected leaders such as Mayor de Blasio, Comptroller Stringer and Speaker Johnson about the accelerating climate crisis. Our state and local elected officials must act now. Hear what our elected officials plan to do to confront the climate crisis as we put the peoples’ questions to them. From stopping fossil fuel projects, to a just transition to 100% renewable energy for all, to divesting public funds and building out transit, we need our elected officials to act. Together, let’s show them our movement will hold them accountable to achieve the bold, equitable and transformational action our communities need! Co-organized by a growing list of organizations including 350.org, 350 Brooklyn, 350NYC, Bronx Climate Justice North, Divest Invest, DSA – Climate Justice, Food & Water Watch, Green Education and Legal Fund, Manhattan Project for a Nuclear-Free World, New York Communities for Change, New York Public Interest Research Group, Nuclear Age Peace Foundation, the People’s Climate Movement – NY, Riders Alliance, Sane Energy Project, Sunrise NYC, United for Action, and the Working Families Party.